Chelsey Philpot, author of EVEN IN PARADISE, on the benefits of early morning ocean breezes and jumping out of airplanes. 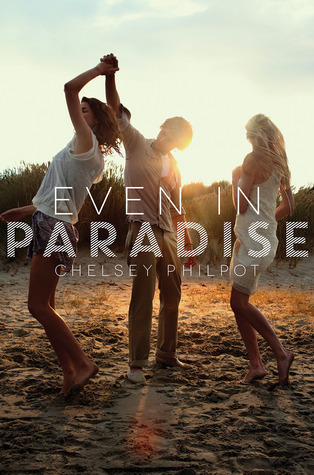 0 Chelsey Philpot, author of EVEN IN PARADISE, on the benefits of early morning ocean breezes and jumping out of airplanes. What is your favorite thing about EVEN IN PARADISE? That it’s a real book…kidding…but kind of not. Truthfully, I am so grateful that I had a story to tell and that that story is now a beautifully designed book that readers can read—that readers want to read. When my three siblings and I were growing up, our father used to say, “the day is half over by ten o’clock.” We grew up on a farm and even as adults, we all still cling to the habit of waking up wicked early. I wrote Even in Paradise in the dark hours of the morning at an old wooden desk in my shoebox-size Brooklyn apartment. I drank cups and cups of coffee so strong it seemed like I should be able to chew it. In warmer months, I wore faded T-shirts and too large shorts. In colder months, I pulled on a ratty cashmere sweater or one of the many well-worn flannel shirts I’ve stolen from my father. For my second book, I’ve kept to this ritual, save for the facts that my desk is now in New England instead of Brooklyn and the morning breezes that come through my window smell of the nearby ocean instead of the donuts baking in the bodega on the corner of Fourth Avenue and Union Street. This question has been answered eloquently and thoughtfully by many talented writers, and I second their advice. It is so true that in order to be a writer you have to read, work at it every day, and accept setbacks as challenges. To this wisdom, I would only add this in: To be a writer, you have to choose a brave life. Not just because writing is difficult and requires tenacity, but also because I’ve found that the larger you live, the more you have to write about. Jump out of airplanes. Travel. Say “yes” instead of no. Live out of a suitcase. Start conversations with strangers. To poorly paraphrase Henry David Thoreau: you cannot sit down to write if you have not stood up to live. I am working on my second young adult novel. I’m not ready to say much about it, but I will share that part of my research involved skydiving. When Julia Buchanan enrolls at St. Anne’s at the beginning of junior year, Charlotte Ryder already knows all about the former senator’s daughter. Most people do... or think they do. Charlotte certainly never expects she’ll be Julia’s friend. But almost immediately, she is drawn into the larger than-life-new girl’s world—a world of midnight rendezvous, dazzling parties, palatial vacation homes, and fizzy champagne cocktails. And then Charlotte meets, and begins falling for, Julia’s handsome older brother, Sebastian. But behind her self-assured smiles and toasts to the future, Charlotte soon realizes that Julia is still suffering from a tragedy. A tragedy that the Buchanan family has kept hidden … until now. Chelsey Philpot is a bibliophile, museum haunter, and library devotee. She writes about books, culture, travel, and the arts for the Boston Globe, New York Times, BuzzFeed, and many other publications. When she's not actuallywriting, she teaches writing at Boston University. Before moving to New England, she was a book reviews editor at School Library Journal in New York City. HarperCollins will publish her first young adult novel, Even in Paradise, in October 2014.